When Slack made our product available in Japanese in November 2017, it was hardly a newcomer to Japanese companies — we already had 190,000 Daily Active Users (DAUs) in Tokyo, 315,000 DAUs across Japan, and 100,000 paid seats. Customers ranged from mobile services giant DeNA and online entertainment service leader DMM, who adopted Slack Enterprise Grid across their companies, to global media company Nikkei. And even before we had a Help Center in Japanese, enthusiastic customers developed their own in-depth guides and books to help teams collaborate in Slack. In other words, a lot of people in Japan wanted to use Slack enough to make the English version work for them — and now that it is available in Japanese, there are 280,000 DAUs in Tokyo and 500,000 across the country, with 155,000 paid users. In fact, Japan recently became Slack’s second-biggest market behind the United States. The Japanese workforce is undergoing a transformation known as Work-Style Reform, and Slack is honored to be a part of many companies’ approach to organizational change. The reforms include legislation to improve work environments and new practices to increase productivity and work-life balance; Japanese businesses are working to be more transparent, collaborative, and aligned at every level of the organization. For more and more of them, Slack is a tool in that evolution. 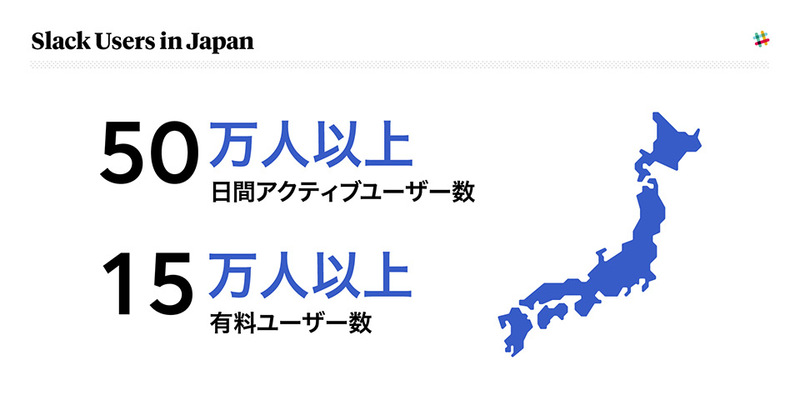 In addition to the early adopters in Japan, companies including Yahoo! Japan, Uzabase, Globis, and Cookpad use Slack as their collaboration hub to bring the right people and information together. To celebrate and deepen our relationship with the Japanese business community, Slack hosted an event today in Tokyo that highlighted our customers and their work, including a discussion with leaders from DeNA, Mercari, and Dentsu Digital. Slack’s commitment to Japan will continue to expand in the coming months; we plan to double our staff in Tokyo by the end of the year, and will continue to build capacity and partnerships to better serve our customers. As Japan continues to be a leader in creative innovation across industries and around the world, Slack is proud to play an ever-growing part in bringing its people and ideas together.